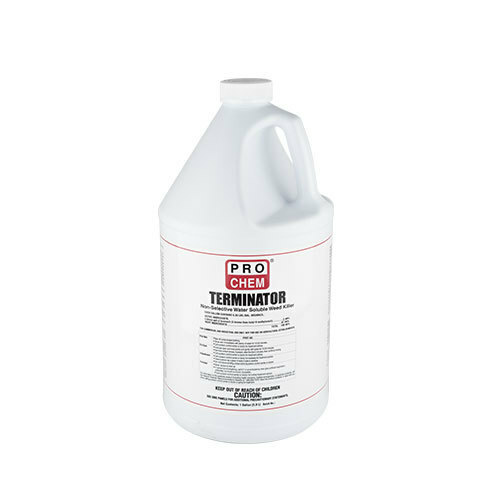 TERMINATOR | Pro Chem, Inc.
TERMINATOR is a water-dilutable, concentrated herbicide which provides up to one full season of non-selective vegetation control. Dilutes up to 1:9 with water making it extremely economical. It is non-corrosive to most metals making it safe to use in areas with metal pipeline and equipment. Its non-flammable properties allow it to be used around previously potentially dangerous areas. 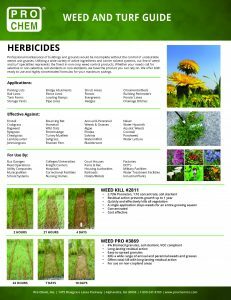 TERMINATOR is an effective, general herbicide for use on non-cropland areas for control of brush and many undesirable weeds and grasses. The effects of the product will become apparent when the chemical has been carried into the root zone by moisture. Translocation and root absorption produces extensive root kill of unwanted weeds and provides long-term control. Dilute concentrate with water and apply as directed on label. GENERAL DIRECTIONS: This product is a liquid, non-selective, general herbicide which is designed to be used where control of all vegetation is desired. It produces rapid kill of all succulent vegetation. Translocation and root absorption produce extensive root kill of weeds and provides long-term control. Sufficient moisture from rainfall or artificial means is necessary after treatment to carry the chemical into the roots of the weeds. This product is recommended for non-crop areas such as railroads, highways, pipelines, tank farms, lumber yards, fence rows and parking lots. This concentrate can be sprayed or sprinkled on. If sprayed, direct the spray to the soil at the base of the weeds and adjust for coarse spray to prevent drifting. Thoroughly clean spray equipment with a suitable chemical cleaner before using for other purposes or do not use same equipment for other purposes. Do not reuse this container for other purposes.